Plain rings for 1 1/2 inch diameter indoor or outdoor curtain rod. Available in two colors in stock, ready to ship. It can be used indoor or outdoor. Use on those windows that face patio or pool area, or use inside on any window. Charleston collection by Design Elements. 2 inch inside diameter, 2 1/2 inch outside diameter. Flat endnd cap for 1 1/2 inch diameter indoor or outdoor curtain rod. Available in two colors in stock, ready to ship. It can be used indoor or outdoor. Use on those windows that face patio or pool area, or use inside on any window. Charleston collection by Design Elements. Use this spring tension curtain rod with your sidelight curtains if the window is recessed. A brass finished adjustable cafe curtain rod by Kirsch. P580-025: 7/16" tension curtain rods 18"-28"
P581-025: 7/16" tension curtain rods 28"-48"
Bright brass finish, projects 3 1/2 to 4 1/2 inches, clearance 2 1/2 to 3 1/2 inches. Rods are metal, slides and finials are plastic. Extra slides available sku 1-428. 1 1/2 inch Elegance II. drapery hardware collection by Graber. 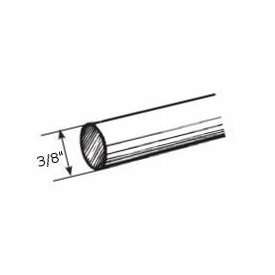 1-421-8: Decorative traverse rods 28-48" projects 3 1/2" to 4 1/2"
Iron Art by Orion corner or bay window bracket for 1 inch and 3/4 inch round rods. This is an exterior fit to the round curtain rod. This means the rod slides into the bracket. Rod Diameter --select-- 3/4" 1"
Ball finial for 1 1/2 inch diameter indoor or outdoor curtain rod. Available in two colors in stock, ready to ship. It can be used indoor or outdoor. Use on those windows that face patio or pool area, or use inside on any window. Charleston collection by Design Elements. Kirsch drapery traverse rods. All rod can be ceiling mount drapery rods or wall mount. Curtain hardware rods by Kirsch. Two way draw Kirsch drapery rod, includes 10 slides, Extends from 30 to 48 inches. Superfine Traverse Rod is the workhorse for durable installations. See how to install drapery rods in the support section. Superfine Traverse Rods include drop in brackets, supports and cord tension pulley for installation. Made from heavy gage steel with a baked enamel finish. Exclusive Kirlon on all sliding surfaces. Push in brackets and extension plates are available as an option. Only the finest pulley sets are used. Strong and durable with a slide gate for easy removal of extra slides. Long wearing, stretch resistant polyester cord and continuous lacing for use at either end or to convert to a one way draw. 3305-025: Double curtain rod bracket return 5.5 to 6.5"
Wood end cap for Select Wood 2 1/4" diameter wooden curtain rods. 1 3/8" L x 3" H.